In the sad death of Robin Bertram members of the Study Circle have lost a friend, a guide, a collector of note and unfailing generosity, and a leader with immense energy and drive for the progress of his chosen pursuits. He will be impossible to replace. Several Officers and members attended his funeral service in Bedford on October 25 to pay tribute to his memory, but we were outnumbered by far by family, his former police colleagues and members of other organisations - philatelic, keep-fit and charity - to which he managed to find time to devote part of his life. After his sudden death on holiday in Shanghai, this was an occasion to celebrate a full life well spent rather than to mourn its untimely end. Robin was born on June 12 1940 and joined the Circle in March 1968 as ESC 137 while still a serving police officer, duties which precluded attendance at most meetings. He came to the Circle's rescue in March 1990 when taking over in emergency as Secretary/Treasurer, and after seven years in that position succeeded John Sears as Chairman, a role he fulfilled with enthusiasm and infinite good ideas. Retirement in 1991 freed up a little time, and his public role as philatelist proceeded apace: he was an active and industrious member of the Sudan Study Group and of the Royal Philatelic Society, proud to be elected a Fellow, and acted as local representative for several more local philatelic bodies, resulting in his being presented with an Award of Merit by the Association of British Philatelic Societies in 2004 for his work on behalf of the East Midland and East Anglian Philatelic Federation. In January 2003 he led our meeting at the Egyptian Cultural Bureau in London; and this year was the prime mover behind our 75th Anniversary display to the Royal. That both were overwhelmingly successful was due entirely to his drive and enthusiasm. For the Circle he was unstoppable, his popular displays commanding an enormous range and depth of knowledge in many collecting fields, from Cairo-Baghdad Air Mails to the British Consular Offices, to Egyptian revenues, the "No-Value" Official, Avis de Reception, Cigarette Tax, Instruction Markings, Dead Letter Office, Post Office documents, Postage Due markings, the De La Ruse issues, Official stamps and postal stationery … and so on and so on. He was an excellent and evocative speaker. His fascination for stamps led him to explore far overseas. 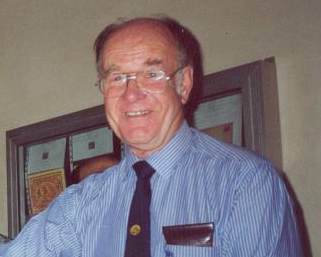 He was a dynamic member of the 1991 and 2001 Circle visits to Cairo, as well as making other trips to Egypt, attending the New Zealand biennial conferences at Matarangi and, as a staunch family man, visiting as often as he could his daughter (and important stamp friends) in Italy. Above all, he will be remembered by the Circle as a firm friend, a resolute and resourceful leader, and a man eager to move heaven and earth to share all information from his extensive store with any colleague who asked. Dear Friends, My daughters would like to join me in thanking you all, for your kind words, cards, letters and messages of sympathy. Also for your very generous donations to Papworth Hospital Trust, made in Robin's memory. At the last count the total was £898. Robin would have been very touched to know that so many people cared.